Sara Groves has never been one to stray away from showing her emotions in her music. Sure, she’s had a few radio hits over the years but her bread and butter is when she slows things down and bearing her soul in the lyrics. Enter 2015 and Floodplain and that’s exactly what we have with Groves’ latest offering. 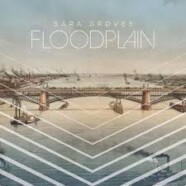 This being her eighth studio record, Groves knows exactly what works for her and the material on Floodplain does just that- it works and it works almost to perfection. If you’re looking for something upbeat and peppy, keep looking, this probably isn’t the album for you. However, if you’re looking for something you can really delve into, listen to during your daily quiet time or devotional time and really sit down and get into the meat of, this is the album for you. This album is as powerful as it is peaceful. The songs that make up the nucleus of Floodplain aren’t to be taken lightly. They’re more to be dissected, studied and meditated upon. This is Groves really getting down the nitty gritty and pouring her emotions into the music- something to be appreciated and not taken lightly. This is art at it’s best and it’s an album you’ll want to listen to a few times through to really appreciate.